and why aren't I there? Every so often during a train trip there are seemingly insignificant periods of discovery and clarity that are only fully appreciated much later. An empty wine bottle found under a bridge would mean nothing to an ordinary person walking by, but imagine what events might have transpired before it was emptied. Although Night Train wouldn't be my first choice under most circumstances, it has in the past turned what could have been an unpleasant stretch of time sitting around waiting for a train into something much more endurable. On the long trip back to the West Coast from Pocatello, we stopped in some town in Eastern Oregon for a crew change. I was just about ready to roll out for the night when I heard the brakeman walking back setting brakes, which ordinarily isn't a good sign. I jumped down to ask him if we were going to be held up here for awhile and he said that there was a problem getting the outbound crew into town and we might be there for several hours. 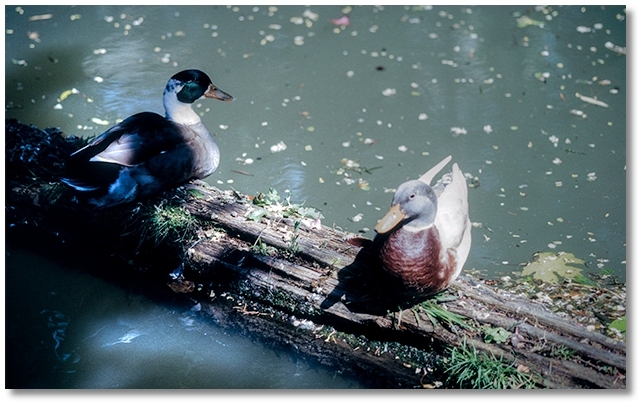 A picture of two ducks on a log — how "ordinary", right? If taken by itself it would, indeed, appear to be rather ordinary or even boring, but within the context of the train trip that I was on when I took the picture, it represents much more. I was in Eugene waiting for a southbound when the Bull drove up and "requested" that I move on. Gathering up my stuff, I walked down the embankment under the bridge and made my way out of the yard, ready to circle back as soon as he drove off. 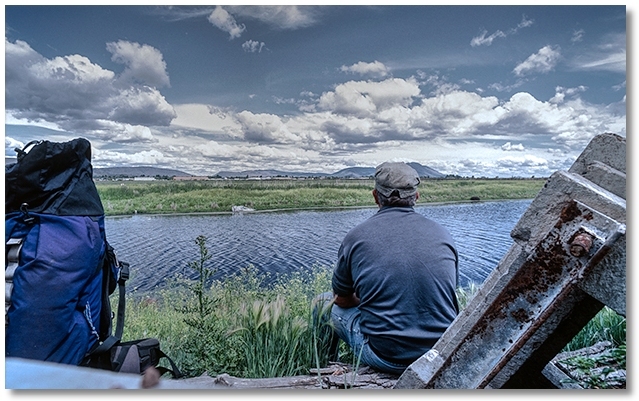 I found a secluded spot to wait beside a small lake and bemoaned the fact that I would lose my vantage point overlooking the yard, which would necessitate getting up every so often and walking over to see if anything was happening to indicate a train being made up. Bored as I was just sitting there, I was ecstatic to see the arrival of a flock of ducks settling down on my end of the lake. Shortly two ducks paddled over to where I was hanging out and climbed up on a log to study me, as I studied them. Breaking off some chunks from my precious stash of Boudin French Bread, I tossed them over to the ducks and a bond was immediately established between Man and Fowl. This continued until I had to cut them off before my bread supply vanished, but I hoped that my presence was as welcome to them as their's was to me. 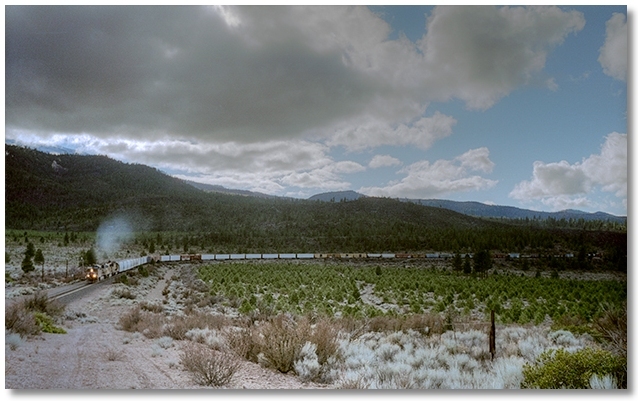 Riding trains for hours and hours forces us to see everything except ourselves in motion — and watching a train pass by while we're standing still is another way of experiencing the same event but from a different perspective. In the 5 minutes or so it took this train to pass from a distant sound in front of me into a distant sound behind me I was the observer, and the train was the "event" — causing me to think about how many times the roles have been reversed, with myself again the observer and the passing landscape serving as the event. There's something about riding trains that enables one to focus on one object while letting everything else (i.e. the background) remain a blur and retain no more importance than functioning as sort of a placeholder to frame whatever it is that we're concentrating on. If there is a little movement within our field of vision we might notice it immediately, and as the number of moving objects increases our recognition of them decreases until so much of our consciousness is in motion that we block everything out except that which is not in motion. Sometimes on train trips I'm running back and forth, looking out the door at everything flying by, but other times I can sit still and watch a fly crawl along the boxcar wall, oblivious to anything else. Actually, it's me who is oblivious to everything else, not the fly, although I don't know that for a fact.